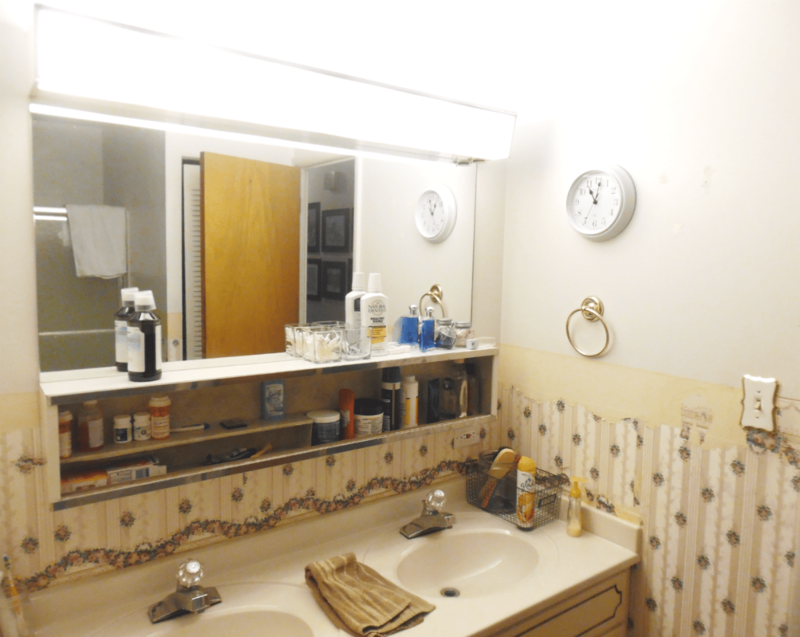 You are here: Home / Home / Featured on Wayfair – Main Bathroom Makeover!! Hi friends, things have been a bit slow around here and my posts have been rather scattered lately. You know, home and priorities must come first. But guys, I wanted to share the excitement with you!! We redid this main bathroom, last Spring, and I am delighted to share that it was featured on Wayfair in May! Say what?????? You mean, as in Wayfair.com, “One of the world’s largest online shopping convenience for home decor & furnishings?” That’s the only one! No kidding! I was beyond ecstatic because when we decided to redo our bathroom, we were not hoping that a big brand or magazine would somehow catch it through mid-air and feature it. Not by any looong stretch of the imagination. All we wanted to do was to make that ugly thing go-away and have a brighter room and prettier space to look at! Light and bright was what we were hoping for in this small space and that’s exactly what we accomplished. This is the second feature this makeover has received with the first, being shortly after the completion. I have not told you about it. What I have learned from this bathroom makeover is that my home does not have to be the most polished to be featured by the most popular. I mean, have you seen the before? It caught your attention, didn’t it? LOL! It was like this when we bought the house. The after though was well worth it. Some paint and the correct vanity lights were really all we needed to make this space pop. We truly loved the makeover and apparently, my little point and shoot camera (at the time) must have captured it well because so many readers loved it too. If you are looking for ideas about choosing vanity lighting for your bathroom(s), you’ll definitely want to read this Vanity Lights Buying Guide and learn about why and how we chose our vanity lighting. While you are there, you’ll also find tips and inspiration from some other bloggers about choosing vanity lights. Even if you are not currently looking for vanity lighting, this guide would be great for pinning and saving for later or for sharing with someone you know is looking to update their bathroom vanity lights!! Wow! Congrats! You always have such great makeovers and home decor tips. It doesn’t surprise me that Wayfair loves it too! I always love seeing your tips and tricks. Awww, Alli! Thank you so much! It was kind of shocking! I am happy you think I offer some good tips!! Congratulations!!! So exciting! I remember that makeover, it was a lot of work for you guys with a fabulous outcome! Thank you Shirley! Glad you remembered it! That wallpaper..lol! It definitely needed to go. A little paint and good lighting made all the difference! What a wonderful way to get rewarded for your your hard work !! Thank you Mary! I appreciate your support – I’m so glad the makeover could be of help to others! Wow! What a difference removing that wallpaper makes! True – it was a great decision! Thanks! What a major transformation that is! Removing wallpaper always makes a huge difference too! Thanks Joscelyn. It’s amazing what a few changes could do to a room!! Wow that’s awesome, and a super impressive makeover on that bathroom! Thank you Kallie!! We definitely were very happy with the bathroom changes!! Love it! Your bathroom looks great 🙂 Such a big transformation! Thank you Kristen!! 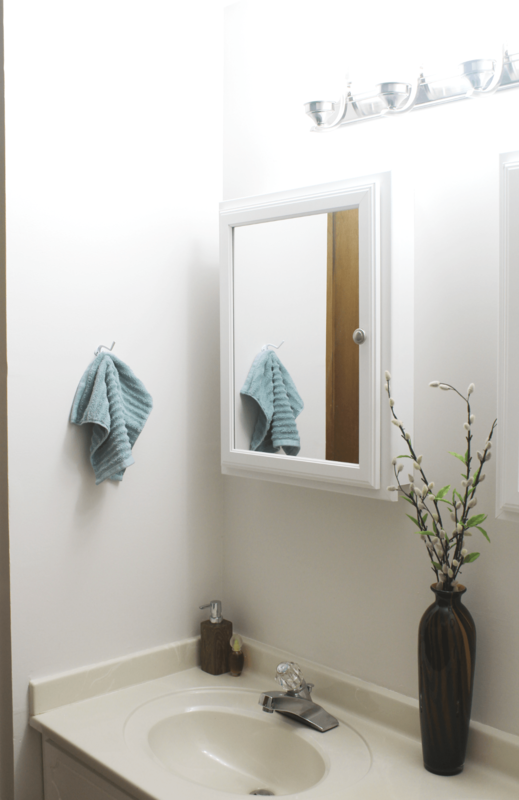 We really loved the clean fresh look of the bathroom! What an amazing difference a light fixture can make! I’ve been contemplating getting a new fixture in my bathroom but really had no idea where to even begin! I love Wayfair and never would have through to look there for bathroom fixtures! Thanks for sharing! Oh great! And you are welcome!! Hope the guide is really helpful to you. Wayfair is one of the places I love to look for products – all the time. Hope you find the right choice of lighting! !